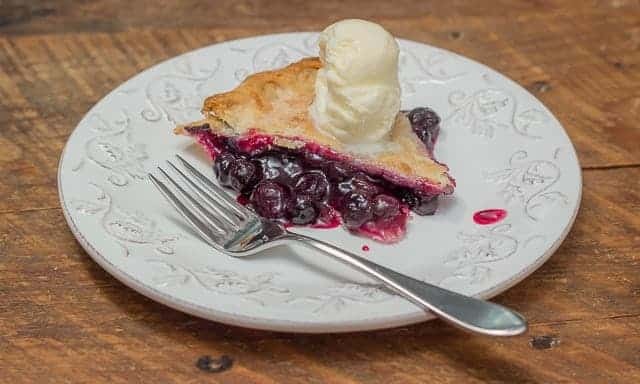 Blueberries are my favorite fruit, and at least ONCE a summer, I have GOT to have a homemade blueberry pie, and nothing else will do! 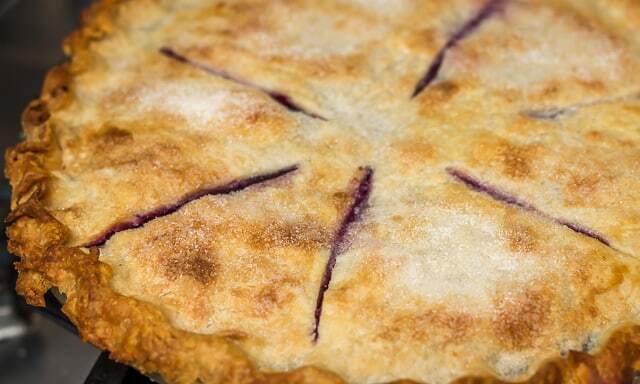 My mom made blackberry pies when I was a little girl that everyone else in the family loved…except for me! I just couldn’t handle the crunch of the blackberry seeds. But I have a feeling, now that I have my own kids, that whenever she’d make a blueberry pie, she’d smile inside, knowing how pleased her baby girl Susan would be. Pie, Pie, Me Oh My! 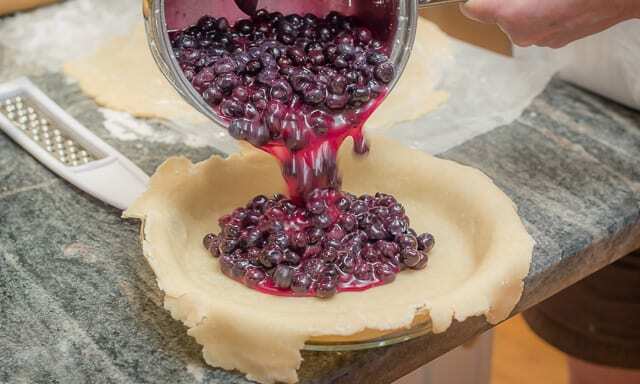 I sure do love me some blueberry pie! Blueberries Are Good, and Good FOR You! Blueberries are always on those lists of Top 10 Super Foods, and for good reason. They are packed with antioxidants, and antioxidants destroy free radicals! (Free radicals are responsible for doing a lot of damage to our bodies.) 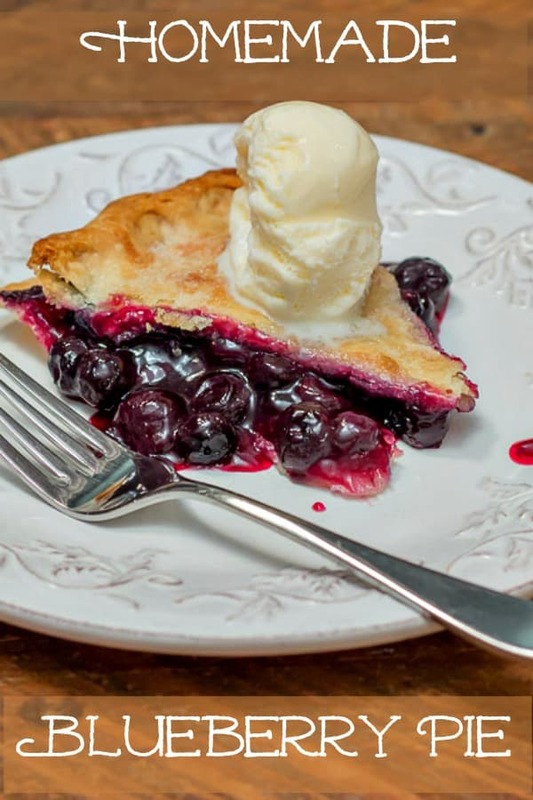 So, pie or no pie, blueberries are one of the best foods you can eat. Teresa Kindred is the hardest working woman I know. She’s the owner of Bellview Blueberries, and the owner of the website, Nanahood., where she writes about the second half of the motherhood journey. When I have time to pick my own, my friend Teresa owns a blueberry farm up in Edmonton, KY, called Bellview Blueberries. It’s about a two hour drive for us from the Nashville area, but it’s worth it to me, just to get to spend some time with Teresa. 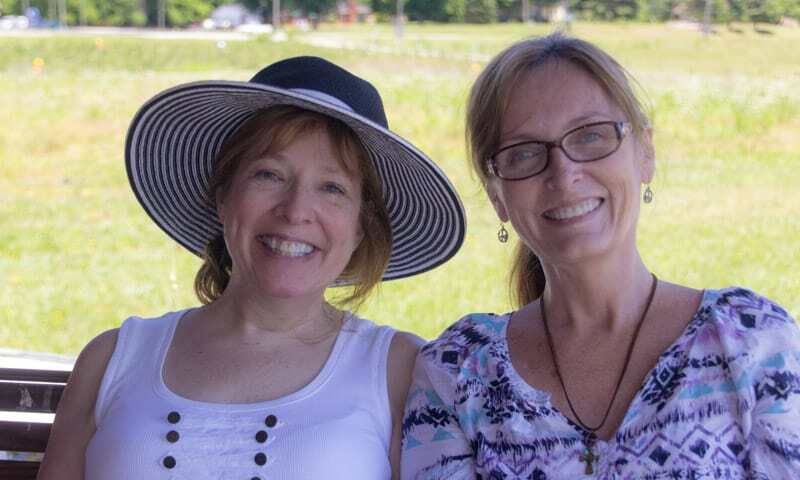 That farmland has been in Teresa’s family for five generations, and Teresa and her husband Bill are really turning it into someplace special. It’s going to be a destination where families can bring their kids, and enjoy picking berries together. 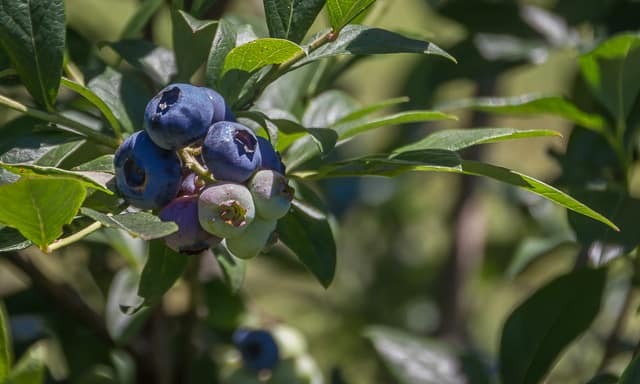 If you live in the vicinity of Bowling Green KY, or Metcalfe County, I’d encourage you to check out the their scrumptious, organically grown blueberries! 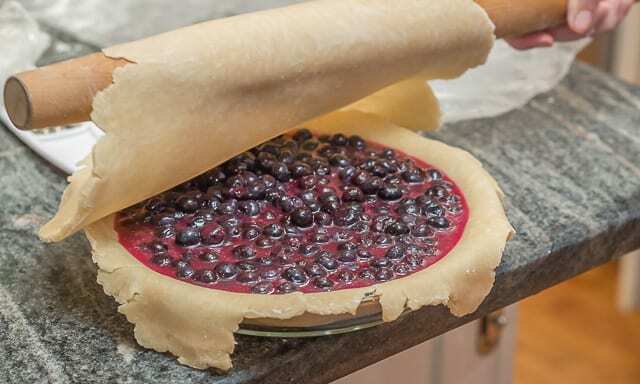 Blueberry pie is surprisingly easy to make! I love to make it for guests, when we’re having company for dinner. Who knew that such a simple recipe could be such a show stopper? It’s a positively holy moment when people have their first bite! I have so many sweet memories of serving pie to appreciative friends! If compliments are what fill your “emotional cup”, prepare to feel immensely gratified. Your friends and family will LOVE this pie! I’m including some pictures here of the pie being assembled. Pouring the pie filling into the bottom crust. 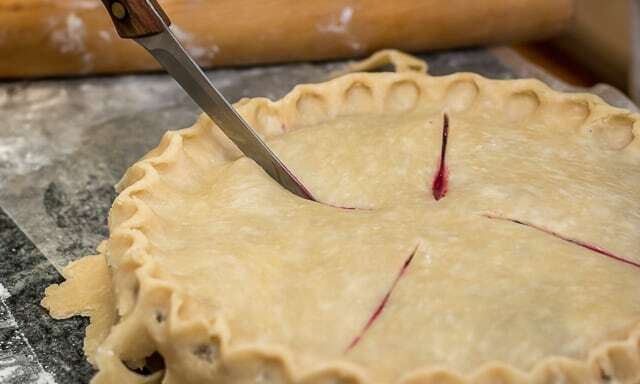 I roll the 2nd crust around my rolling pin, lift it up, and unroll it gently overtop the pie. If you don’t know what it means to “flute” the pie edges, this is all there is to it. Cutting some slits in the top crust to allow some steam to vent. I dab some half & half over top of the crust to add a sheen, and then sprinkle it with sugar. This is the best blueberry pie I've ever had. It ain't braggin' if it's the truth. 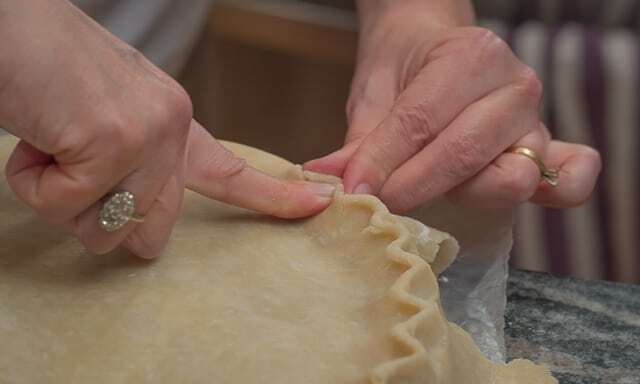 Combine flour and salt; cut in shortening with pastry blender (use two forks if you don't have a pastry blender) until mixture resembles coarse meal. Sprinkle cold water (1 T. at a time) evenly over surface; stir with a fork until dry ingredients are moistened. Shape into two discs and wrap each in plastic wrap. Chill for at least 1 hour. Combine sugar, cornstarch and salt in saucepan. Add water and 2 c. blueberries, cook over medium heat, stirring constantly, until mixture comes to a boil and is thickened. (Mixture will be quite thick - I added another 1/4 c. water to mine at that point to get the consistency I wanted, which was somewhat thinner.) Remove from heat and stir in butter and lemon juice. Add remaining blueberries. Pre-heat the oven to 400º. 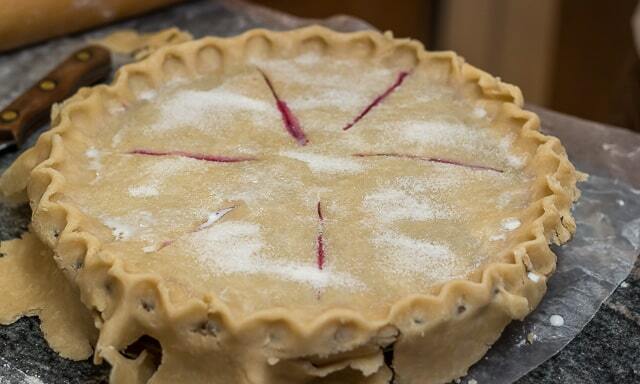 Roll out the first pie pastry disc and place in pie dish. Cover with 2nd rolled out pastry disc. Flute edges, and cut in vents for steam. Here's a little trick I learned from my Momma and it will give your crust a sheen, and a sparkle: take about a teaspoon or so of milk and kind of dabble and smooth it over the top of the crust, and then, sprinkle about a tablespoon full of sugar on top of the crust before you slide it in the oven. Bake at 400º for 35 minutes. I sure would appreciate it if you’d share this post: either on Pinterest, or Facebook, or Reddit, or StumbleUpon, or Flip, or Yummly, or wherever you share great recipes with those you love! This one’s perfect for Pinterest, after all! Share it, why don’tcha?